When Can You Start Training a Puppy With an Invisible Fence? An invisible dog fence can be a valuable tool in keeping your dogs safe from predators if you don’t want a physical fence in your yard and don’t want to have to deal with a long, drawn out installation process. But, if you have puppies or if you’re considering bringing a new puppy into your household, you should keep some things in mind before installing an invisible fence or bringing a puppy into a home that already uses one. A puppy needs to be around 8 weeks old before they can really start learning how to react to the invisible fence and understand where their boundary lies. The reason for this is that they’re just getting old enough to start learning how to communicate with not only you, but to understand the social cues of other, older dogs that are around them as well. Their mental capacity for understanding is exploding around this time, so attempting to train them for anything before this will be difficult Their attention spans just aren’t long enough before this age to be effective. 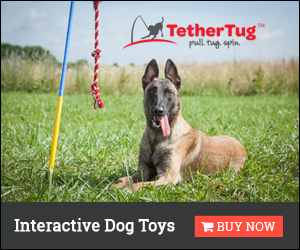 Your puppy should already be able to sit, stay, and perform other basic obedience commands before you try to train them to stay within the invisible fencing system. This training should also start around 8 weeks. All dogs should learn these commands, but these are of particular importance when you’re teaching a puppy to stay in your yard. Even though the invisible fence can deter your dog from leaving the yard, it may not always stop him, so basic obedience commands are a necessity. When they already have basic obedience commands down, you know that your pup is ready to learn more advanced commands and cues from an intelligence standpoint. The less basic obedience your pup understands, the longer it’s going to take to train him to understand the fence and its boundaries. Most invisible fence manufacturers recommend allowing around 14 days for your dog to truly get the hang of it. You’ll be using the flags that come with the fencing system to show your dog where the boundary is and teach them to respect it… or else. The collar may or may not shock them, depending on what kind of setup you have. Some collars produce electrical shocks when the dog attempts to cross the boundary, while others can produce audible warning tones or even vibrations. What options you have available to you depends on the system you’ve purchased. If you want something that has much less of a learning curve, you should check out this foolproof dog fencing system instead.